Here are the best MetaStock and trading websites online. These are the sites that we have personally bookmarked and that we visit ourselves. Keep up to speed with what I'm doing. Find out who is David Jenyns the entrepreneur, author and trading coach? Discover the process David uses for designing profitable trading systems. Download his free trading system methodology now. Trading veteran, David Jenyns, reveals how he sets excellent money management. The first practical, step-by-step, method for designing profitable trading systems no matter what you like to trade, how much experience you have or what kind of budget you have. Stuart McPhee & David Jenyns show how easy it is to design a disciplined trading system tat works. Check out the DVDs now. David Jenyns & Justine Pollard's personal mastermind group. Within this small community we plan to reveal only our best trading tips, tricks and tactics. If you're looking to improve your own personal wealth watch the videos many of my coaching clients have paid top dollar for. Discover How A 25 Year Old Ballroom Dancer Turned $25,000 into $2.25 million. Taking you through the 3Ms to trading successfully - mindset, money and method. All the information you will need to develop a trading plan that is right for you and that you will implement with confidence. Do You Make These Psychological Mistakes In Your Trading? Find Out Now! It doesn't matter whether you trade the Forex, Stocks, Futures, CFDs and/or Options you need to master your trading psychology. The makers of Metastock… Sure their program isn’t perfect but it does the job. Without doubt, the best backtesting software available anywhere. TradeSim finishes what Metastock started with Enhanced System Tester. When combined together, Metastock & TradeSim, cannot be beaten. Don't purchase TradeSim... until you read our review. 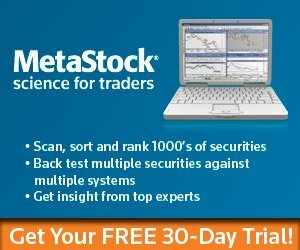 One of the biggest Metastock forums out there. I've archived it for your easy access.